Everything about MWC Barcelona is larger than life. The annual trade show, formerly known as Mobile World Congress, this year entailed nearly 30 acres of exhibition and hospitality space at Fira Gran Via, 2,400 participating companies, more than 109,000 attendees speaking countless languages (7,900 of which were ceos and only 25,000 of which were women), an array of mini conferences and all the fervor you might expect at the world’s largest mobile event. Like its counterpart, CES, it’s a trade show on steroids. Indeed, it’s the kind of experience you can’t truly capture until you’ve lived it, and this was our lucky year. EM hopped a plane to Spain for this year’s show, Feb. 25-28, and, in between tapas and sangria breaks, traversed the eight massive exhibit halls that comprise MWC to discover the latest trends in experience design, attendee engagement and event technology. The event, organized by GSMA, is one well-oiled machine. Staffers and signage reached as far as the eye could see and, in our case, we were particularly grateful for the employees helping attendees navigate the complicated metro system at the end of each long day. We also enjoyed the wide variety of eateries on-site, from sponsored rooftop gardens to restaurants built right into the show floor. And then there were GSMA’s extensive sustainability efforts, which entailed everything from badge recycling bins to the event’s carbon-neutral footprint. But from an event perspective, our favorite aspect may have been BREEZ, a facial recognition system that allowed us to easily enter the event each day without waiting in line or scanning our badges. “Intelligent connectivity” served as this year’s theme, which focused on the intersection of hyper-connectivity, 5G networks, the Internet of Things, artificial intelligence and big data, and the majority of booths encompassed these elements in one form or another. But aside from the technical aspects, we noticed a number of other trends permeating the show floor. Exhibitors at MWC, or as we like to call the event, Land of 1,000 Ficus Trees, went heavy on natural elements like stones, plants, water and even peat. Japanese garden-style décor was a popular motif, as was the use of natural woods. We also spotted a large number of upper-level, private meeting spaces, wall-sized moving graphics, hyper-realistic still images, raw machine parts on display, in-booth security guards and a whole lot of craft coffee to keep attendees charged. And that was just during the day. As the evening crept in, brands loosened up, offering everything from live ham shank-carving (no offense, but gag) to music performances to a few brands handing out cold ones. We encountered a few negative aspects, too, like exhibit hall 2, which should be renamed “Meetings Only, And You’re Not Invited,” as well as a large chunk of real estate occupied by Huawei, which was only open to invited guests and manned by glorified booth babes-turned-bouncers dressed in traditional garb from a variety of countries. But the good undoubtedly outweighed the bad. It’s hard to say exactly which brand reigned supreme from an experiential point of view, so we’ve compiled a list of our favorite booth experiences and a few honorable mentions that captured our attention. Grab a churro and settle in. Your tour begins now. One look at T-Mobile’s vibrant booth and you knew you were about to have a whole lot of fun. Dripping from top to bottom in the brand’s signature hot magenta color, the footprint was like an experience design field day featuring mirrored materials, incandescent surfaces, bright, oversized graphics as far as the eye could see, stadium seating designed for presentations and even graphics built into the floor. The space was divided into vignettes like “Smart City” and “Industry Performance” and offered touchpoints like an autonomous concept car, a social virtual reality engagement and a “tangible” VR experience featuring an oversized, interactive orb. This one kept our heads on a swivel in the best possible way. We weren’t too familiar with China Mobile before attending MWC, but by the time we left, the brand’s booth had made our list of top picks. The space offered a nice balance of fun and educational components, and carried a distinct natural theme. Our favorite element was an interactive floor designed to look like a koi pond that reacted as we moved around it. Nearby, moving wall graphics made it appear, at times, as if we were standing beside a waterfall. There was also a 5G virtual reality gaming experience that took place on stationary bikes and an eye-catching, illuminated 3D model of a 5G smart city, an element found in many MWC booths. Amid a floor of booths that filled up every square inch of space, IBM’s clean, minimal design was a standout. The brand’s footprint featured a variety of mirrored surfaces and neutral tones that made for a relaxing environment. Leveraging an “agility at scale” theme, the brand used cube-shaped pods and an interactive touch screen “agility cube” to offer immersive, technology-themed storytelling experiences and case studies, with topics like “Unraveling the complex world of music royalties.” We were also hoping to spot that Watson-powered beer personalization experience, but this is MWC not SXSW, so c’est la vie (Agency: George P. Johnson). Given its mobile payment offerings, Visa’s presence at MWC made sense, and its booth didn’t disappoint. Natural woods and a living wall helped balance technological components, like a vehicle installation featuring real Bentley parts connected to a tablet that offered a glimpse at how connected cars and mobile apps will simplify parking payments in the future in large cities. There was also a mobility experience combining several modes of transportation to showcase a single mobility system, private meeting rooms and an intelligent vending machine that let (pre-enrolled) attendees “pay” for chocolate via facial recognition. Although Android occupied a large, indoor booth designed for private meetings, it was the brand’s full courtyard takeover that quickly captured our attention. Taking up a vast outdoor space between two exhibit halls, Android’s footprint was a welcome retreat from the bright lights and buzz of the show floor. Lush with greenery, flowers and even a full-sized tree, the footprint served as a smart neighborhood of sorts, and included a mini version of a record store, an art gallery featuring augmented reality, a boutique that showcased the Google Lens tool, a hotel, a functioning coffee shop, an arcade, a street art installation, a tranquil lounge space with hanging swing chairs, a house complete with a brick façade and mailbox, an interactive vending machine filled with guaranteed prizes and an eye-catching display of various sized screens all melded together. Phew. Certainly one for the books. Similar to Android, Nokia executed a full courtyard takeover featuring a smart city theme with a café and mini homes, but it was the brand’s indoor booth that stopped us in our tracks. The smart city theme carried over here, and thanks to Nokia’s massive footprint, it almost felt real. Largescale cityscape graphics and realistic building facades and pillars added to the authenticity, along with “paved” city roads, interactive windows and street signs. The array of engagements was endless, but among our favorites were VR ping-pong played across a real table and a dedicated industrial space that closely resembled a real factory. And, at the back of the booth, staffers guarded a sectioned-off area where demos were conducted. We apparently didn’t merit an invitation. 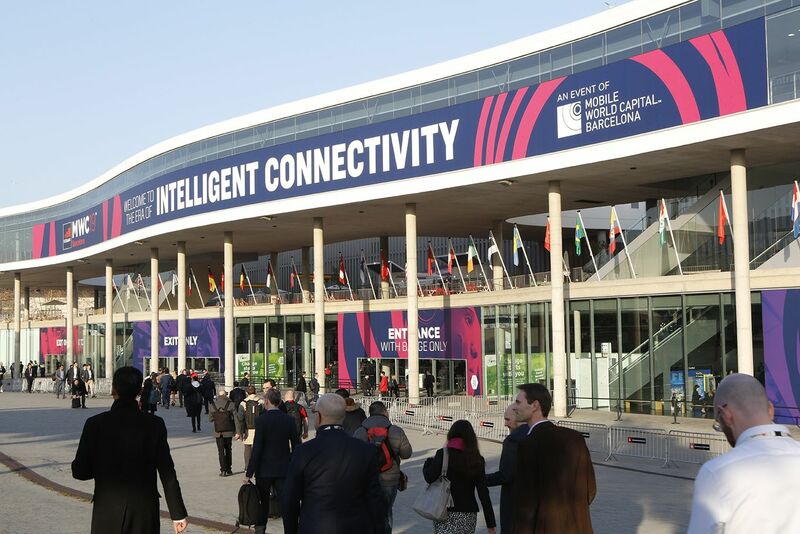 GSMA’s Innovation City was a dedicated area featuring event partners KT Corporation, Sierra Wireless, Huawei, Google, Rakuten and Turkcell, designed to bring the intelligent connectivity theme to life. The organization’s post-event stats show that more than one-third of attendees stopped by the space, which was rich in demos across a variety of sectors including entertainment, transportation, the environment and robotics. A standout was the colorful Google Tree surrounded by everyday items and arranged as micro art installations featuring themes like “Getting Stuff Done” and “Play, Events and Socializing.” Another real showstopper was KT’s 5G Skyship, a flying emergency rescue system, which was showcased through a hyper-realistic cockpit installation, complete with joysticks, controls and massive screens, that attendees could climb inside (Agency: George P. Johnson). At first glance, Samsung’s booth looked like a glorified Apple store, with backlit wall displays and rows of products available for inspecting, but it was much more than initially met the eye. A clear attendee favorite was the Galaxy Orbit video experience, which took place inside a globe-shaped structure and was accompanied by bumping music and dancing brand ambassadors encouraging participants to get their groove on. Nearby, an interactive floor invited attendees to take on a step challenge, while a beat challenge turned participants into temporary djs. There was also a veritable shrine to Samsung’s newly released Galaxy Fold phone, which was housed in a glass display case and roped off to prevent attendees from touching it (a tad dramatic, if you ask us). But the brand made up for it with a mesmerizing display featuring a large collection of the flexible phones combined into a single entity that moved and pulsed with upbeat music. Latvian mobile operator LMT’s sustainable booth was a true showstopper. The exhibit, built entirely out of peat moss by two award-winning artists, stood in stark contrast to the flashy displays featured in the vast majority of this year’s booths. The exhibit showcased a variety of 5G use cases for developing solutions in areas that have limited coverage. Among the touchpoints: a mini racetrack installation, a larger-than-life cell tower, a glimpse into search-and-rescue drone projects and a mini woodland area showcasing forestry solutions, complete with fog effects. Attendees were fully engaged everywhere we turned, from a carousel of objects that could be viewed in augmented reality with iPads to a robot spider demo to two full-service restaurants built into the space and designed for private meetings to a haptic pen challenge that required two people working in tandem to a “5G Prix” experience featuring VR goggles and a mini racetrack installation. There was also a chic (and massive) upper level meeting area that offered panoramic views of the lower level of the booth footprint. Design elements included heavy use of natural woods, a striking entrance featuring a jagged blue material that attendees could reach out and touch and “color with purpose,” according to the brand. But our favorite aspect of the booth may have been Ericsson’s collaboration with Vodafone. Each brand offered live music performances each day, but here’s the catch—half of the band played in Ericsson’s booth and the other half played in Vodafone’s space. The band was able to play in sync from totally separate spaces thanks to 5G. Color us impressed (Agency: Jack Morton Worldwide). Always a master at trade show experiences, Intel wowed us with a gigantic 3D wall displaying a smart city with an accompanying panel that moved over and highlighted various parts of the map to showcase the smart city ecosystem. There was also a virtual industrial safety demo conducted with a robot, a mixed reality Batman experience, a mock grocery aisle that demonstrated how AI and computer vision will enhance retail experiences, a Spider-Man multi-player VR engagement and a broad range of other hands-on technology demos. Telefonica’s dynamic booth attracted us from afar with geometric-patterned installations lit up in various pastel colors that reached from floor to ceiling. While part of the brand’s aim was to present a new way of producing TV content with 5G, which it achieved with a detailed mock talk-show set and various other touchpoints, the booth was multi-faceted and addressed a number of topics, from gaming to 5G-powered stadiums. To get the most out of the experience (and allow Telefonica to capture some attendee data), visitors were invited to take an RFID wristband through the space, which they could tap on various screens that prompted questions about their technology use. We decided to participate, and at the end of the experience were told that our primary technology concern was privacy, which was associated with a green hue. We were then invited to press our hands on a screen connected to one of the geometric installations, which instantly illuminated in the same green color and moved up and down the structure—a simple engagement that passersby seemed eager to participate in. A presentation space built right into the footprint rounded out the booth experience, which ultimately offered a solid mix of education, demonstrations and good clean fun. We wish we could review every last booth that caught our attention at MWC Barcelona, but since we can’t, we’d like to recognize a few additional footprints that deserved some love. Here’s the rundown: HPE stopped attendees in their tracks with a real NASA suit and a realistic- looking space capsule from which the brand appeared to be broadcasting live. Mastercard’s booth didn’t feature a single use of its name—only that easily recognizable orange and red logo. Xiaomi offered a small racetrack as part of a transportation demo where attendees could scoot around in the brand’s Mi Electric Scooter, Ninebot or Go Kart. And Vodafone’s booth offered striking experience design featuring bold reds, a mirrored wall and a massive, 360-degree screen hanging above the center of the booth.